Our position on Brexit and the five things we need from government for dementia research to thrive. 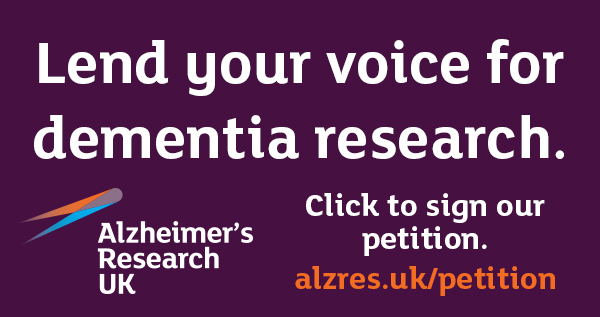 We need continued investment to attract the best researchers and consistent regulation to enable collaboration, which together will bring effective treatments to dementia patients more quickly. As of 2017, dementia is the leading cause of death in the UK. Of the top 10 causes of death, dementia is the only one without effective treatments to slow or stop it. One out of three people born in the UK today will develop dementia in their lifetime and one in four NHS hospital beds are occupied by someone with dementia. The annual cost to the UK economy is £26 billion and rising and is expected to more than double in the next 25 years. Unless a disease-modifying treatment can be found, by 2025 there will be over one million people in the UK living with dementia, and over two million by 2050. It is the health crisis of our time and without an effective treatment it will only worsen. Alzheimer’s Research UK is the UK’s leading dementia research charity dedicated to diagnosis, prevention, treatment and cure. Our mission is to bring about the first life-changing treatment for dementia by 2025. It is within reach, but dementia research must be nurtured through Brexit to ensure we bring about those treatments as quickly as possible. British science has been among the biggest beneficiaries of EU research funds: between 2007-13, the UK paid €5.4bn (£4.7bn) to the research budget and received €8.8bn (£7.7bn) in grants. This funding has been particularly important in dementia research, which has been historically underfunded compared to other disease areas, like heart disease and cancer. Since 2012, dementia research capacity in the UK has grown substantially and research is closer than ever before to finding a treatment or cure for dementia. However, the UK Government must secure predictable access and influence to shape EU research programmes and schemes post-Brexit to ensure they align with UK priorities. The UK has a thriving science and innovation sector, not just for dementia research, but across many research areas. The success of this sector relies on attracting and retaining the best people from around the world. Currently, 26% of academic staff in UK universities are non-UK nationals1. For the UK to continue to compete against other countries as a world leader in science and innovation, it must attract and retain the best researchers, innovators, entrepreneurs, legal and regulatory experts and students. There is also a severe shortage of skilled technicians in the UK. It is vital that any future immigration system supports recruitment from overseas to fill these skilled positions as well as train the next generation of technical staff in the UK. EU regulatory frameworks help build consistent research standards between countries, facilitating the exchange of ideas, research samples and data. This is particularly important in the case of rare and ultra-rare diseases. Because 0.1% of the proportion of diseases that cause dementia are rare or ultra-rare2, studies across multiple nations are the only way to access the large-scale patient groups needed for robust research. The availability of international data can also facilitate longitudinal research studies, which have a critical role in understanding long term conditions like dementia. The government must ensure that a future regulatory framework facilitates international collaboration and data sharing, guaranteeing that the UK can lead international research projects, such as clinical trials. Collaboration in research projects is essential in a small research field such as dementia where expertise is spread across many countries. Research grants through the EU have allowed some of the most talented and innovative researchers in the field to work together, all under the same funding programme. For those from outside the EU, it’s a complicated process to apply to work on a research project in Europe and to receive funding for it. The results of these opportunities are initiatives like the Joint Programming on Neurodegenerative Diseases (JPND). The JPND facilitates collaborative funding and focuses on specific projects such as the harmonisation of biomarkers in clinical research and involves 23 countries aligning research endpoints in order to make cross country comparisons of their results. Our analysis shows that the proportion of internationally collaborative UK dementia publications has increased from 51% in 2008 9 to 61% in 2014-153. Once the UK has left the EU it is important to UK dementia research that opportunities to collaborate with colleagues in the EU and across the globe are maintained and enhanced. It is vital that Brexit does not delay UK patients accessing new treatments for dementia when they become available. Treatments for dementia are still in the development stage, but drug development experts anticipate specific challenges for the licensing and uptake of the first generation of disease modifying treatments because of the expense and difficulty in showing efficacy. Having a national rather than EU-wide system of medicines regulation must not result in slower access to treatment for people with dementia. The government should secure maximum co-operation and alignment with the EU on the regulation of medicines and medical devices and ensure a transitional arrangement with the EU on regulatory frameworks, databases and medicines protocols to ensure a smooth transition and patient safety. Dr Diego Gomez-Nicola is Associate Professor for Biological Sciences at the University of Southampton, carrying out important research to support drug development for Alzheimer’s disease. Dr Gomez’s 15-strong lab includes researchers from across the EU. The iASiS project is a pan- EU consortium, including Alzheimer’s Research UK, looking at harnessing precision medicine to revolutionise the delivery of healthcare to patients. Precision medicine promises to pave the way for a more preventive and predictive approach to healthcare with improved treatments and patient outcomes. Project iASiS is a Horizon 2020 funded project, which is using big data to build a platform for clinicians to support more efficient and personalised diagnosis and treatments of patients. This approach is currently being tested in two disease areas – Alzheimer’s disease and lung cancer – with the longer-term goal of applying it to other disease areas.